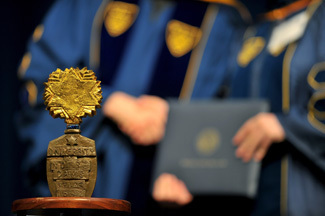 The University of Notre Dame’s Graduate School recognized 288 master’s and 159 doctoral degree recipients and presented several special awards during Commencement ceremonies today (Saturday) in the North Dome of the Joyce Center. Timothy Roemer, United States Ambassador to India, delivered the Commencement address. He also was recognized as the recipient of the Graduate School’s Distinguished Alumnus Award. 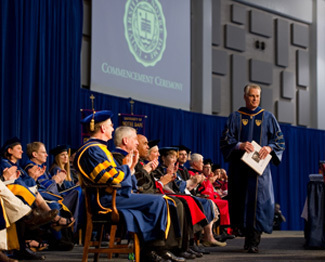 Roemer, who earned master’s and doctoral degrees in political science from Notre Dame, told the graduates that that they were leaving Notre Dame prepared to take on the challenges of the world, although the world is a much different place than it was when he graduate from the University 25 years ago. “Twenty-five years ago, the major events of the day were driven and influenced by nations and governments,” he said. “Yet today, transnational actors and actions play just as important a role as governments and nations in ways that are often unpredictable and unannounced. “A pastor in Florida can threaten to burn a Quran, which is picked up and broadcast by an Iranian news channel that is watched in Kashmir, resulting in protests, riots and several needless deaths. “These are some of the characteristics of the world that you are about to enter as you leave Notre Dame,” the ambassador told the graduates. "Who knows how it will look in 25 years when one of you is standing in my shoes and giving this commencement address? After the Commencement ceremony, graduates were congratulated by their advisers, family, and friends at a lunch reception in the Jordan Hall of Science. Originally published by William G. Gilroy at newsinfo.nd.edu on May 21, 2011.